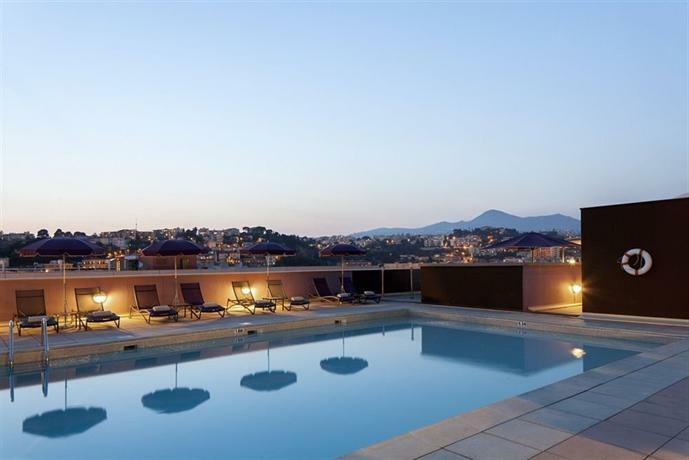 Located on the 6th floor of the 4 star NH Nice Hotel the rooftop pools offers skyline views of Nice. The outdoor heated pool features a stone tile pool deck, large shade planters, a canvas topped shade pergola, sun loungers, sub umbrellas, sophisticated up lighting, and pool side bar and restaurant known as Terrazura. Terrazura offers traditional French Mediterranean cuisine and classic cocktails. Terrazura is open for Lunch Monday to Sunday 12:00 pm - 2:00 pm, Dinner Monday to Sunday 7:00 pm - 10:00 pm. The bar is open Monday to Sunday 9:00 am - 11:00 pm. The seasonal pool is open 9:00am to 10:00pm daily, May through September.